Anyway, despite all the work that was piling, we went for Lunch In The Dark at Ngee Ann Poly on wednesday. It was a program to let people know more about a blind person. I was quite afraid at first as I DO NOT like the darkness. AT ALL. I was shaking when I went in and even contemplated to get out of that place. We were lead and served by blind people. When I went in, i really cannot see a single thing at all. Whether if I am closing my eyes or opening. At one point I didn't even know if my eyes were open or closed. 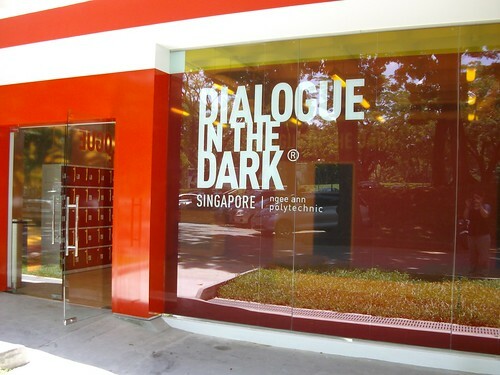 Before going in, we were told to not scream by our lecturers even if we are really afraid of the darkness as a respect to the blind. The people there then asked us to keep all our belongings in the lockers and took our spectacles away as we will not be needing them inside. They gave us a brief introduction about this program and told us the positioning of our cutleries. Then, we were given hand sanitizer (which my friend heard as appetizer wtf) and we were passed to our (blind) servers for each table. As I was about to go in, I swear I was damn scared. I rmb holding Eunice's hand and closing my eyes because then I can tell myself I cant see anything is because my eyes were closed. We were lead to our seats and after everyone got seated down, our delicious food is served. Boy, IT IS YUMMY. Prolly because I'm really hungry at that time lol. The people next table to us were damn noisy, they kept talking damn loudly like they are in the studio I cant even hear whats my server saying -.-"
Oh ya, when my server asked our table if anyone needs another napkin. Someone shouted "me me me!" And my server asked, "who is me? did you like, raised your hand or something? hahahahaha" To which the person answered "yes..." and everyone laughed. (idk if you get the joke but nvm I'll explain anyway, it means that the person raised up her hand for nothing because no one can see it) Our server was really nice and told us how he moved along his way outside. After the meal, lights were on for us to see the surroundings and if we had made a mess eating. And I realized I dropped my knife on the floor -.- After that, we took a photo with the people and went back home/school. It was a really great experience despite my fear for darkness and unknown places. I recommend everyone to go there if you have the time. I'm not sure about the price but I heard that it was about $20. I went for free because our school paid for it. PS: we are not allowed to disclose what we ate inside because it will be no surprise for other people. Anyway, I don't know will it be the same food. Also, photos were not allowed inside, which explains the lack of photos post.